Reboot 10 was everything I thought it would be: chaotic, stimulating, frustrating and fun. It’s an odd conference, pitched somewhere between TED and a BarCamp, carried off with a distinctly European flair. The speakers delivered the goods on a wide range of subject matter. Howard Rheingold was as thought-provoking and interesting as you would expect, Jyri shared his thoughts on social interaction online and I thoroughly enjoyed listening to David Weinberger riffing on Charles Babbage and Claude Shannon . With at least three tracks of simultaneous talks at any one time, and with plenty of catching up to do in the corridor, I didn’t get to see all the talks but a superb round of micro-presentations gave me the opportunity to get the quick versions of talks I missed. My presentation seemed to go down fairly well although I thought I was just rambling on. Maybe the fact that I was accompanying myself on mandolin meant that the audience was more forgiving. I didn’t really have slides, just a few hyperlinked documents to tie the narrative together. The theme of this year’s Reboot was Free . Fittingly, my presentation resulted in my receiving two free gifts. Michael Rose, a local piano player, gave me a CD on which he accompanies a series of Irish tunes. 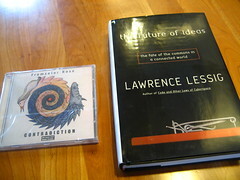 Nikolai—who was introducing the speakers and taking care of the sound in the room where I was presenting—was reminded by my mention of Lawrence Lessig that he had boxes full of The Future of Ideas that were originally destined for the Danish parliament. They were distributed amongst the attendees of Reboot instead.